It's another one of those pesky Thursday-shipping weeks thanks to the Labor Day holiday in the U.S., so there are no new comics at your local shop today. Instead, all your weekly comics goodness will arrive to stores tomorrow. So don't go running out to your shop this afternoon in search of all the wonderful that I'll be talking about in a bit. Because, if you do, you'll just get laughed at. But before we get to the stuff that you can't buy until tomorrow, I'd like to mention a book that came to an end a little while back, and is now collected in a myriad of different formats. 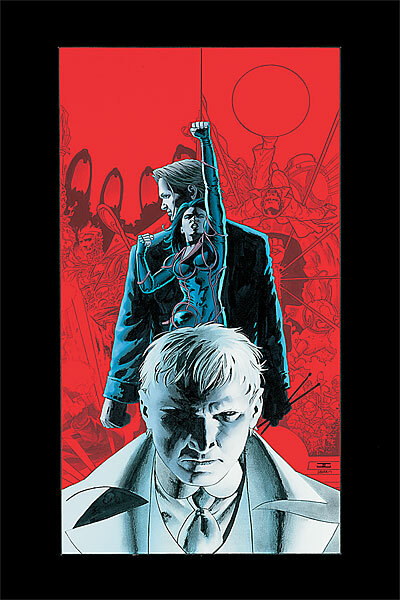 When I first started reading comics, Warren Ellis' and John Cassaday's Planetary was The Book of the Moment. Everyone was talking about it, and the series was just about at its halfway point*, and it was getting amazing reviews from fans and critics alike. Billed as a science fiction adventure story following a group of "Archaeologists of the Impossible," Planetary is really a graphic history of the comic-book medium, disguised as an unrelentingly entertaining comic book story. I picked up a couple of issues of the series back in 2002 or 2003, and, while I liked what I was reading, I didn't really get what I was reading, or why there was so much fuss about the series. You see, since I had just started reading comics when I picked up my first issues of Planetary, I couldn't understand all of the in-jokes, all of the references, and all of the fun. Now, though, since I am (embarrassingly) enmeshed in comics culture and history, those same in-jokes work on a number of levels, and as I read the series in its entirety for the first time (I've just finished issue 20), I am thoroughly enjoying the work. In fact, with the exception of Ellis' Frankenstein's Womb short graphic novel, and his (wacky, but excellent) novel, Crooked Little Vein, Planetary is my favorite work of his thus far. And, considering the sheer volume of good work he's done in his career, that's saying something. So, while this is not an Official Exfanding Review, I did want to briefly mention the book, and I wanted to mention that (thanks to steep Amazon discounts), I am reading the series in the oversized, Absolute hardcover editions. Which are truly the best way to read and digest comics stories and art. These things are stunning. Expensive, sure. But stunning, nonetheless. Comics art is supposed to be seen on big pages--that's why the original art is drawn on 11 X 17 in. art board. Anyway, so yeah. Planetary is great, and I'll do a proper review when I finish the series. I'm also making my way through Grant Morrison's The Invisibles, and I'm on volume two of that series. Reading both books at the same time is probably not healthy for my brain, but we'll see what happens. I have my tinfoil hat ready, so I should be fine. Speaking of fine, there are some fine products coming our way tomorrow--not today, remember--and here are a couple of things that I'm looking forward to. First up, we have a book that I've been waiting for since the release of the pretty much under-everyone's-radar first series. 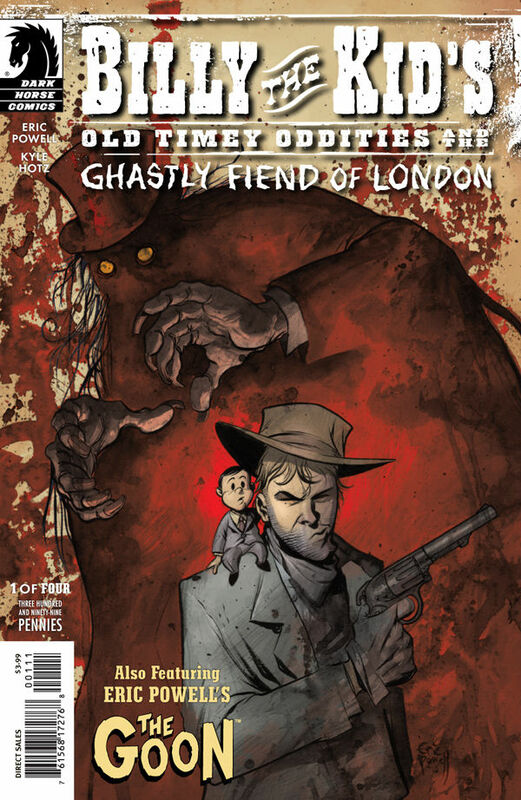 From Goon creator Eric Powell, Billy the Kid's Old Timey Oddities and the Ghastly Fiend of London, issue one, ships today. And it promises to be awesome. Just look at that cover--how could it not be awesome? It can't, I tells ya! It can't not be awesome. Picking up where the critically acclaimed (if not commercially successful) first series left off, Ghastly Fiend is a perfect jumping-on point for new readers of Powell's Billy the Kid world. Check out the solicitation information from Dark Horse, below. It does a nice job of setting up the series and its overall premise. The world believes the notorious outlaw Billy the Kid was killed by Pat Garrett, but in reality the Kid is very much alive, the hired gun of Fineas Sproule's traveling spectacle of biological curiosities--or "freaks," as Billy calls them. In their latest adventure, Billy and crew confront their most vicious challenge yet: Jack the Ripper! 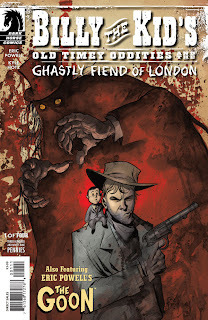 In London to visit a true Elephant Man, Billy, Sproule, and the company learn about the Whitechapel murders and the fact that disfigured people are being blamed for the killings and targeted for mob justice. As the group applies themselves to the case, Sproule looks for information at every bar in the city, while Billy tags along to drink whisky and flirt with prostitutes at each one-which might be a better way to find the Ripper than he realizes. * Includes Goon backups by Eric Powell! See? Told ya it sounds pretty cool and--waittaminute! Did that say Goon backups by Eric Powell? Well, now. Recommended reading has just become required reading, folks. If you're looking to throw your money at something today at the store, throw it at this book. 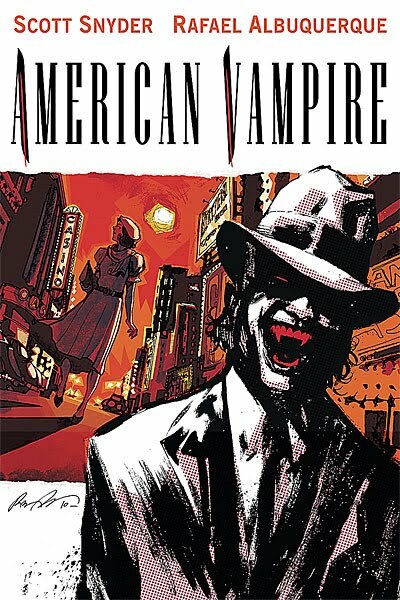 Next up, we have issue six of the hit Vertigo series, American Vampire. Written and created by Scott Snyder, and with additional stories by Stephen King and outstanding art by Rafael Albuquerque, this series just wrapped up its first story arc. And, while those first five issues will be collected in a fancy hardcover in the next month or so, now's a great time to jump on board this series. Issue six marks the beginning of an all-new story, so new readers should be able to pick the book up and follow along just fine. I'd definitely recommend doing just that, and if you like what you read, either try tracking down the first five issues (they should be readily available at your comics shop) or wait on the collection. This is good, good stuff, and it's one of my favorite new series of 2010. 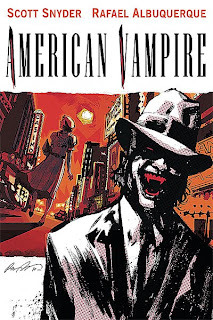 Actually, come to think of it, American Vampire might be my favorite new series of 2010. The writing is great, and Albuquerque's art really shines in this turn-of-the century tale. Definitely check it out if you happen to pass by it on the racks. And with that, I must leave you. Back to work for me. But before I go, a reminder, and a question. First off, remember, books ship tomorrow, not today. And, secondly, what are you Waiting for? *Editor's Note: Because of several reasons, including Ellis' health issues and Cassaday's scheduling conflicts, it took the Wildstorm-published series until 2009 to wrap up its 27-issue run.